Growing up and honing his skills on the famous Brodhead Creek, his first experience with a fly rod was at the age of 13. He learned by watching and fishing with Don Baylor, Ernie Schwiebert and many other fine fly fisherman through out the years. Tying began in earnest around the same time for him as he preferred to catch fish on his own flies. Alan ties many different types of flies and enjoys the challenge each presents…Some that he ties are Catskill style flies, classic streamers, wet flies, spey flies and classic Atlantic salmon flies both hair wings and married wings. Growing older, Alan's horizons grew and he has been regularly fishing on numerous streams in CT, NY, PA and NJ including limestoners such as the Saucon, Little Lehigh, Letort, Penns Creek, Fishing Creek. He also fishes notable freestone streams such as the Beaverkill, Willowemoc, Brodhead Creek, Big Bushkill and many others, to the great tail waters of the East and West Branch of the Delaware and the Farmington River. 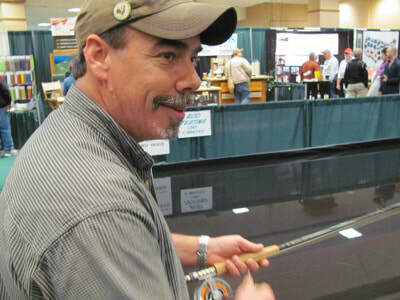 Alan regularly fishes the Great Lakes region for big steelhead, lake run browns and salmon. He's a member of the Brodheads Chapter TU , Catskill Fly Tiers Guild and a member of the fly tying pro team for Flymen Fishing Co. He enjoys teaching the art of fly tying to others and he's done so through classes held at various fly shops and Trout Unlimited meetings, as well as tying at most of the major East Coast Fly fishing shows.